According a study conducted by Western New England College's Department of Mechanical Engineers, "The best way to reduce drag, and improve gas mileage for pickup trucks, is to add a tonneau cover." 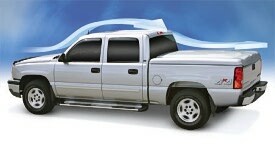 Their study yielded gas mileage savings of 8% by adding a tonneau cover to a Dodge Ram. From "Tailgate Talk - Does Removing A Tailgate Affect Fuel Economy?" According to many experts, the best way to improve a pickup's fuel economy is to leave the tailgate up and cover the bed with a quality aftermarket Tonneau cover. "Tonneau covers on pickup boxes reduce aerodynamic drag," said Ford's Jack Williams. "We've seen reductions of about 8 to 10 percent on the F150. The average steady-state [cruise control] fuel economy improvement at highway speeds is closer to 5 percent."